I am afraid I have run into some transmission troubles and I am not the guy for that job. While riding home from work yesterday, it felt and acted like the chain was trying to come off... Impossible to see the back sprocket while driving but that's what it felt like. Giving a little jerk and a popping sound randomly. I slowed way down and crawled home at about 30 mph. I got home and checked the chain and it definitely had more play in it than it should have. So I took off the front sprocket cover off and made sure that it was at least seated on the sprocket and then went to work on tightening the chain. With that complete I had thought my problem was solved. Later I rode it the couple of miles down to the gas station. There is definitely something going on. While giving the bike gas, there was a very rhythmic tick to the bike and feedback that coincided with it. With the clutch pulled in and coasting, there was no issue. Revving the engine, there is no issue. Coasting (as in not giving the bike gas, or pulling in on the clutch) I am not sure about, I was trying to hard to "feel" something wrong, so if it was doing it, it was barely noticeable but it may have been. Giving the bike gas, there was a very noticeable and very rhythmic problem. I am assuming that there is something going on with with the transmission. I didn't take the chain off the bike to see if either sprocket was missing any teeth when I got back from the gas station but that is probably something that I should do. But considering that the problem was not present with the clutch pulled in and rolling, I doubt that is going to amount to anything. I glanced at the teeth I could see when I parked it but didn't see any obvious issues. Got a sinking feeling that my 89's days are numbered. Last edited by cloudee1; 09-03-2015 at 10:20 AM. Don't dig a hole just yet, even though it coasts fine it's more than likely your chain that's at the end of it's tether rather than the trans. 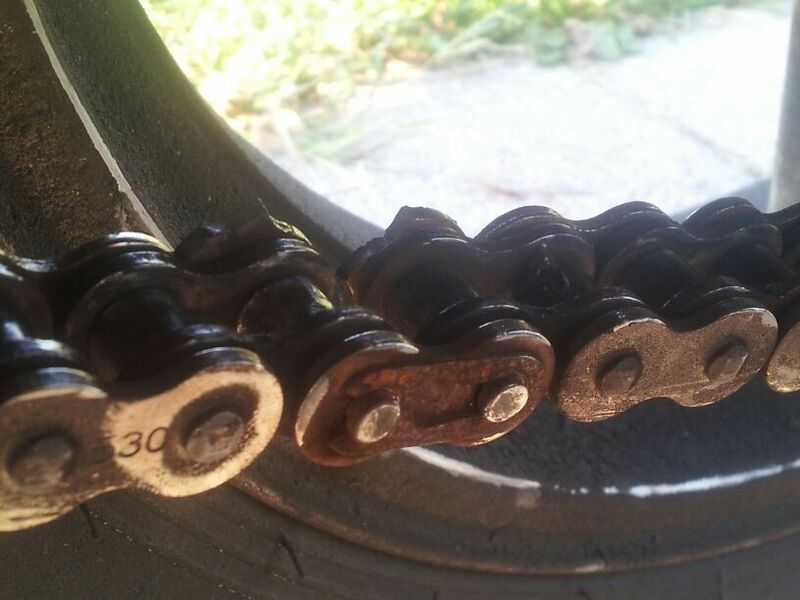 Give the chain a proper and thorough onceover, I'll bet you'll find a seized link that's sticking. The symptoms are exactly what one normally causes. If nothing is out of the ordinary drain the oil and look for metal shavings but my money is on the chain. You might just be right there Mattson. I have stopped digging the hole. Got home from work tonight and started on taking the chain off. I found the issue (I can only assume) at the same time that I found the master link. Ordered a replacement master link off of Amazon and will be stopping by the shop during lunch tomorrow to pick up another one. The spare will be added to the tool bag... just in case. I have never had a link give out like that before. I can only assume that during the ride home yesterday the chain was loose enough that it was trying to come off which caused it to crack. Then I probably over tightened the chain which is what finished it off. The ride home from work, the issue was sporadic, but after tightening the chain, it was very rhythmic. Last edited by cloudee1; 09-03-2015 at 08:04 PM. I would seriously consider changing out the chain and both sprockets as a set, if it was me. Tomorrow with the new link in hand, I plan to pull the chain off and fully inspect both sprockets for anything beyond normal wear. Also I am going to clean up the chain and give it a good going over to look for anything out of the ordinary. On a side note, it looks like I really need to clean that back rim. Looking at the posted image, it is just coated in crap. OUCH! Consider yourself VERY lucky for not currently having a split engine case caused by a failed chain being curled up at the front sprocket. On a side note those clip links should not be used on a street bike, says it right there in the box of the chain, should always be riveted. Might just be crap but that chain looks like it wouldn't be a bad idea to let it out to pasture as well. What a pain this has turned into. Let me start off by saying that whoever made the chain that was on my bike should be shot. So I was a couple hours from home and I drove passed a Honda shop. Figuring I would go ahead and take care of getting a new master link I stopped in. 10 bucks later I had the link in my pocket and was headed back home. Once I made it, I tried putting the master link on the chain. The pins' diameter was too large for the chain. Figuring I just got a link that wasn't made to spec, I ran down to the local shop and bought another one. This time though, I had the foresight to bring the chain with me. Yet again the new link didn't fit the chain. What a pain in the ****. So needless to say, I wasn't going to try and track down the mfg of the chain and order a special link, instead I just went ahead and bought a new one. Even that was an adventure. The shop I was currently at didn't have a chain long enough, they had a 530 x 108 though. So off I go. I stopped at the Indian dealership and they said they didn't carry chains. Off to the next shop, they had a 530 x 120... which would work if I cut some links off, unfortunately they wanted 180 bucks for the chain. Once more I hit the road and pulled into another shop. They had a 530 x 114 for 70 bucks. Still had to to cut a few links off, but it was less than half the price of the other shop and I was out of options. The chain has been cut down, and is now on the bike. The sprockets still looked pretty good so I left those in place. Short of a test ride to make sure everything is good to go, it looks like this issue has been resolved. I even went ahead and cleaned up the rim while I was at it, it is now a pretty white again.